The classic 'edutainment' series has been updated for a new generation of kiddos. If you grew up in the ‘80s and ‘90s, there’s a chance you played a Reader Rabbit game, either at school or just for fun (or both, really). These popular educational titles starred the title character and his animal friends, who would go on adventures that helped kids learn about subjects like reading, spelling, and math. 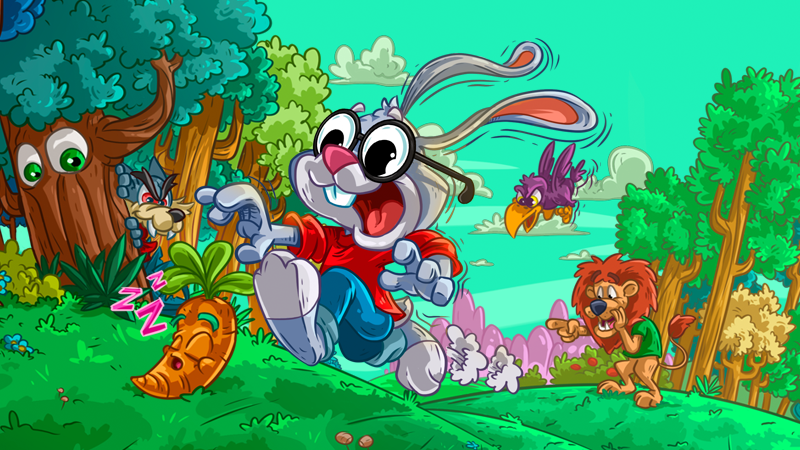 Reader Rabbit is back in a new game for today’s digital-savvy kiddos. Reader Rabbit: Jumpsmarter is side-scrolling platformer for Apple TV that challenges kids to collect all of the carrots that have been stolen by the Big Bad Wolf and scattered around different environments. While playing, littles will need to jump on platforms and avoid or defeat enemies as they collect carrots and other goodies. Apple TV is a hybrid media player that provides access to both live TV and popular apps like Netflix and YouTube. The platform also supports games, with popular titles like Minecraft: Story Mode and Hungry Shark Evolution. Playing action games can be a bit tricky using only the Apple TV remote, but Reader Rabbit: Jumpsmarter will also support any MFi game controllers that have been licensed by Apple. Those can be purchased separately. Reader Rabbit: Jumpsmarter can be downloaded for $2.99 on the Apple TV App Store. The game is rated for children aged 4+. It doesn’t include ads or in-app purchases. We’ve reached out to the game's developer to learn if there are plans to release Reader Rabbit: Jumpsmarter on iOS or Android phones and tablets, and we’ll update this space if we hear back. Update (9/25/18): The game's publisher told us that Reader Rabbit: Jumpsmarter will be coming to iOS devices, as well as the Mac.